Apart from the newlywed couple, flower girl and page boy are probably the most talked- about pair in a wedding ceremony. Simply because they’re sooooo adorable! As the flower girl carries and scatters flowers infront of the bride in a wedding, their dress becomes a highlight as well! So why not pamper your beloved cheeky girl with a classy white dress or a sweet pink bow dress for the occasion! We have gathered 15 flower girl dresses for you to pick from so scroll down to find one that best suits your wedding theme! Is Your Big Day Around The Corner? If it’s a yes and you have yet to secure a wedding photographer, search no further and head over to our website now! 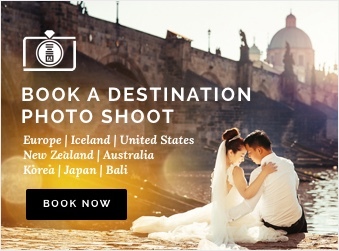 Besides offering destination prewedding photography services, we also provide AD wedding photography! Need a wedding gown/suit? No problem! We provide gown and suit rentals as well so wait no further!